The New Zealand Parliament (Māori: Pāremata Aotearoa) is the legislature of New Zealand, consisting of the Queen of New Zealand (Queen-in-Parliament) and the New Zealand House of Representatives. The Queen is usually represented by a governor-general. Before 1951, there was an upper chamber, the New Zealand Legislative Council. The Parliament was established in 1854 and is one of the oldest continuously functioning legislatures in the world. The House of Representatives has met in the Parliament Buildings located in Wellington, the capital city of New Zealand, since 1865. It normally consists of 120 members of Parliament (MPs), though sometimes more due to overhang seats. There are 71 MPs elected directly in electorate seats and the remainder are filled by list MPs based on each party's share of the total party vote. Māori were represented in Parliament from 1867, and in 1893 women gained the vote. Although elections can be called early, each three years the House is dissolved and goes up for reelection. The Parliament is closely linked to the executive. The New Zealand Government comprises a prime minister (head of government) and other ministers. In accordance with the principle of responsible government, these individuals are always drawn from the House of Representatives, and are held accountable to it. Neither the monarch (currently Queen Elizabeth II) nor her governor-general participates in the legislative process, save for signifying the Queen's approval to a bill passed by the House, known as the granting of Royal Assent, which is necessary for a bill to be enacted as law. The New Zealand Parliament is consciously modelled on the Westminster system of parliamentary representation, developed in the United Kingdom. This system can be traced back to the "Model Parliament" of 1295, generally regarded as the first recognisable parliament. Over the centuries, parliaments progressively limited the power of the monarchy. The Bill of Rights 1688 (which has been ratified as law in New Zealand) established Parliament's role in law-making, taxation, and supply. Among its provisions, the Bill confirmed absolute freedom of speech in Parliament (see parliamentary privilege). As early as 1846, the British settlers in New Zealand petitioned for self-government. The New Zealand Parliament was created by the New Zealand Constitution Act 1852, an Act of the British Parliament, which established a bicameral legislature officially called the "General Assembly", but usually referred to as Parliament. It had a lower house, called the House of Representatives, and an upper house, called the Legislative Council. The members of the House were elected under the first-past-the-post (FPP) voting system, while those of the Council were appointed by the Governor. The first members were sworn in on 24 May 1854 in Auckland. Originally, Legislative Councillors were appointed for life, but later their terms were fixed at seven years. This change, coupled with responsible government (whereby the Premier advised the Governor on Council appointments) and party politics, meant that by the 20th century, the government usually controlled the Council as well as the House, and the passage of bills through the Council became a formality. In 1951, the Council was abolished altogether, making the New Zealand legislature unicameral. At the time of its abolition the Council had fifty-four members, including its own Speaker. Under the Constitution Act, legislative power was also conferred on New Zealand's provinces (originally six in number), each of which had its own elected provincial council. These provincial councils were able to legislate for their provinces on most subjects. However, New Zealand was never a federation comparable to Canada or Australia; Parliament could legislate concurrently with the provinces on any matter, and in the event of a conflict, the law passed by Parliament would prevail. Over a twenty-year period, political power was progressively centralised, and the provinces were abolished altogether in 1876. Unlike other countries, New Zealand had representatives of the indigenous population in its parliament from an early date. Reserved Māori seats were created in 1867 during the term of the 4th Parliament; Māori men aged 21 and over, whether or not they owned property, could vote to elect four Māori members of the House of Representatives. The Māori electorates have lasted far longer than the intended five years. In 2002, the seats increased in number to seven. One historical speciality of the New Zealand Parliament was the country quota, which gave greater representation to rural politics. From 1889 on (and even earlier in more informal forms), districts were weighted according to their urban/rural split (with any locality of less than 2,000 people considered rural). Those districts which had large rural proportions received a greater number of nominal votes than they actually contained voters – as an example, in 1927, Waipawa, a district without any urban population at all, received an additional 4,153 nominal votes to its actual 14,838 – having the maximum factor of 28% extra representation. The country quota was in effect until it was abolished in 1945 by a mostly urban-elected Labour government, which switched to a one-vote-per-person system. Originally the New Zealand Parliament remained subordinate to the British Parliament, the supreme legislative authority for the entire British Empire—although, in practice, Britain's role was minimal from the 1890s. The New Zealand Parliament received progressively more control over New Zealand affairs through the passage of Imperial (British) laws such as the Colonial Laws Validity Act 1865, constitutional amendments, and an increasingly hands-off approach by the British government. Finally, in 1947, the Statute of Westminster Adoption Act gave Parliament full power over New Zealand law, and the New Zealand Constitution Amendment Act 1947, an Act of the British Parliament, allowed the New Zealand Parliament to regulate its own composition. In 1986 a new Constitution Act was passed, restating the few remaining provisions of the 1852 Act, consolidating the legislation establishing Parliament, and officially replacing the name "General Assembly" with "Parliament". Beginning in the 1890s, when the New Zealand Liberal Party was established as the first formal political party in New Zealand, political power shifted from the House of Representatives to elections, parties and leaders. The conservative Reform Party was formed in 1909, and the New Zealand Labour Party in 1916. The New Zealand National Party emerged in 1936 from the amalgamation of Reform and a remnant of the Liberals, the United Party. The New Zealand Parliament is supreme, with no other government institution able to over-ride its decisions. The ability of Parliament to act is, legally, unimpeded. For example, the New Zealand Bill of Rights Act 1990 is a normal piece of legislation, not superior law, as codified constitutions are in some other countries. The House of Representatives has the exclusive power to regulate its own procedures. The House has "entrenched" certain issues relating to elections. These include the length of a parliamentary term, deciding on who can vote, how they vote (via secret ballot), how the country should be divided into electorates, and the make-up of the Representation Commission, which decides on these electorates. These issues require either 75% of all MPs to support the bill or a referendum on the issue. The monarch of New Zealand – currently Queen Elizabeth II, represented in New Zealand by the Governor-General – is one of the components of Parliament. This results from the role of the monarch to sign into law (give Royal Assent to) the bills that have been passed by the House of Representatives. MPs must express their loyalty to the Queen and defer to her authority, as the Oath of Allegiance must be recited by all new parliamentarians before they may take their seat, and the official opposition is traditionally dubbed Her Majesty's Loyal Opposition. The House of Representatives was established as a lower house and has been the Parliament's sole chamber since 1951. As at 2018[update], the House consists of 120 members of Parliament (MPs), elected to a three-year term. Parliamentary elections use the mixed-member proportional (MMP) system, a hybrid of first-past-the-post and party-list proportional representation; 71 MPs represent single-member electorates of roughly the same population, while the remainder are list MPs. These MPs assemble to represent the people, pass laws and supervise the work of government. Members also form select committees, appointed to deal with particular areas or issues. 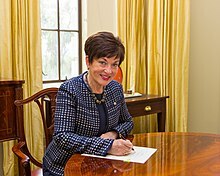 Ministers of the New Zealand Government are always drawn from amongst the members of the House of Representatives (before 1951, there were also ministers who sat in the Legislative Council). The government of the day, and by extension the prime minister, must achieve and maintain the support of the House in order to gain and remain in power. The Government is dependent on Parliament to implement its legislative agenda, and has always required the House's approval to spend money. The Parliament does not have an upper house; there was an upper house up to 1951, and there have been occasional suggestions to create a new one. The Legislative Council chamber continues to be used during the Opening of Parliament. This is in keeping with the British tradition in which the monarch is barred from entering the lower house. 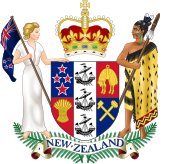 The Legislative Council was the first legislature of New Zealand, established by the Charter for Erecting the Colony of New Zealand on 16 November 1840, which saw New Zealand established as a Crown colony separate from New South Wales on 1 July 1841. Originally, the Legislative Council consisted of the Governor, Colonial Secretary and Colonial Treasurer (who consisted the Executive Council) and three justices of the peace appointed by the Governor. The Legislative Council had the power to issue Ordinances, statutory instruments. 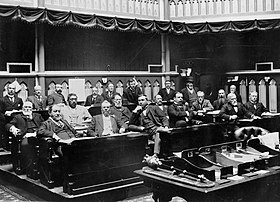 With the passing of the New Zealand Constitution Act 1852, the Legislative Council became the upper house of the General Assembly. The Legislative Council was intended to scrutinise and amend bills passed by the House of Representatives, although it could not initiate legislation or amend money bills. Despite occasional proposals for an elected Council, Members of the Legislative Council (MLCs) were appointed by the Governor, generally on the recommendation of the prime minister. At first, MLCs were appointed for life, but a term of seven years was introduced in 1891. It was eventually decided that the Council was having no significant impact on New Zealand's legislative process; its final sitting was on 1 December 1950. In September 1950, the National government of Sidney Holland set up a constitutional reform committee to consider an alternative second chamber, chaired by Ronald Algie. A report produced by the committee in 1952 proposed a nominated Senate, with 32 members, appointed by leaders of the parties in the House of Representatives, according to the parties' strength in that House. Senators would serve for three-year-terms, and be eligible for reappointment. The Senate would have the power to revise, initiate or delay legislation, to hear petitions, and to scrutinise regulations and Orders in Council, but the proposal was rejected by the Prime Minister and by the Labour opposition, which had refused to nominate members to the committee. The National government of Jim Bolger proposed the establishment of an elected Senate when it came to power in 1990, thereby reinstating a bicameral system, and a Senate Bill was drafted. Under the Bill, the Senate would have 30 members, elected by STV, from six senatorial districts, four in the North Island and two in the South Island. Like the old Legislative Council, it would not have powers to amend or delay money bills. The House of Representatives would continue to be elected by FPP. The intention was to include a question on a Senate in the second referendum on electoral reform. Voters would be asked, if they did not want a new voting system, whether or not they wanted a Senate. However, following objections from the Labour opposition, which derided it as a red herring, and other supporters of the mixed-member proportional (MMP) representation system, the Senate question was removed by the Select Committee on Electoral Reform. In 2010, the New Zealand Policy Unit of the Centre for Independent Studies proposed a Senate in the context of the 2011 referendum on MMP. They proposed a proportionally-elected upper house made up 31 seats elected using a proportional list vote by region, with the House of Representatives elected by FPP and consisting of 79 seats. The Constitution Act 1986 outlines that the Governor-General is responsible for proroguing and/or dissolving Parliament, on behalf of the monarch. Dissolution ends a parliamentary term, after which the writs for a general election are usually issued. Upon completion of the election, the Governor-General, on the advice of the Prime Minister, then issues a royal proclamation summoning Parliament to assemble. On the date given, new MPs are sworn-in and then are, along with returning MPs, called to the old Legislative Council chamber, where they are instructed to elect their Speaker and return to the House of Representatives to do so before adjourning. A new parliamentary session is marked by the Opening of Parliament, during which the Governor-General reads the Speech from the Throne, on the Queen's behalf. This speech is given at the start of every new Parliament, and explains why Parliament has been assembled. It outlines the Government's legislative agenda. On occasion, the monarch may open Parliament and deliver the speech herself; for example, the Queen has personally attended the Opening of Parliament in 1954 (to mark the legislature's centenary), and more recently in 1986 and 1990. MPs receive the Royal Summons to these events from Usher of the Black Rod, after he or she knocks on the doors of the House of Representatives chamber that have been slammed shut, to illustrate the MPs' right to deny entry to anyone, including the monarch. An Act of Parliament. The short title is Haka Ka Mate Attribution Act 2014. Before any law is passed, it is first introduced in Parliament as a draft known as a bill. The majority of bills are promulgated by the government of the day. It is rare for government bills to be defeated (the first to be defeated in the 20th century was in 1998). It is also possible for individual MPs to promote their own bills, called member's bills; these are usually put forward by opposition parties, or by MPs who wish to deal with a matter that parties do not take positions on. All bills must go through three readings in the House of Representatives before receiving Royal Assent to become an Act of Parliament (statutory law). Each bill goes through several stages before it becomes a law. The first stage is a mere formality known as the first reading, where it is introduced without a debate. This is followed by the second reading, where MPs debate on the general principles of the bill. If the House opposes the bill, it may vote to reject the bill. If the bill goes through the second reading, it is sent to a select committee where every clause in the bill is examined. Members of Parliament who support the bill in principle but do not agree with certain clauses can propose amendments to those clauses at this stage. Following its report back to the House, the bill will be advanced to its third reading where only minor amendments will be allowed before it is passed or rejected. If a bill passes its third reading, it is passed by the Clerk of the House of Representatives to the Governor-General, who will (assuming constitutional conventions are followed) grant Royal Assent as a matter of course. Some constitutional lawyers, such as Professor Philip Joseph, believe the governor-general does retain the power to refuse Royal Assent to bills in exceptional circumstances – specifically if democracy were to be abolished. Others, such as former law professor and Prime Minister Sir Geoffrey Palmer and Professor Matthew Palmer argue any refusal of Royal Assent would cause a constitutional crisis. As a practical reality, because the Royal Assent to a bill must follow quickly after its passage by the House of Representatives, if there is any substantial issue about the constitutional validity of a bill, the issue must be considered by the Attorney-General before the bill is introduced into the House. Parliament is currently in its 52nd term. ^ a b c "First sitting, 1854". NZ History. Ministry for Culture and Heritage. 19 August 2014. Retrieved 22 February 2019. ^ a b McLean, Gavin (28 September 2016). "Governors and governors-general – Constitutional duties". Te Ara: The Encyclopedia of New Zealand. Retrieved 1 July 2017. ^ a b c d e f Martin, John E. (17 February 2015). "Parliament". Te Ara: The Encyclopedia of New Zealand. Retrieved 30 August 2016. ^ a b c d "Parliament Brief : What is Parliament?". New Zealand Parliament. 21 March 2014. Retrieved 2 July 2018. ^ "Bill of Rights 1688 No 2 (as at 26 March 2015), Imperial Act". Parliamentary Counsel Office. 16 December 1689. Retrieved 11 November 2018. ^ McIntyre, W. David (20 June 2012). "Self-government and independence - Crown Colony". Te Ara: The Encyclopedia of New Zealand. Retrieved 2 July 2018. ^ a b c d McIntyre, W. David (20 June 2012). "Self-government and independence - Constitution Act 1852". Te Ara: The Encyclopedia of New Zealand. Retrieved 2 July 2018. ^ a b c Martin, John E. (1 February 2015). "Parliament - Evolution of Parliament, 19th century". Te Ara: The Encyclopedia of New Zealand. Retrieved 2 July 2018. ^ a b c d Martin, John E. (1 February 2015). "Parliament - Structural changes, 1890s to 1950s". Te Ara: The Encyclopedia of New Zealand. Retrieved 2 July 2018. ^ Palmer, Geoffrey. "The Constitutional Significance of the Abolition of the Legislative Council in 1950." The New Zealand Journal of Public and International Law 15, no. 1 (2017): 123-47. ^ a b "Legislative Council Chamber". New Zealand Parliament. Retrieved 17 August 2017. ^ "Number of Electorates and Electoral Populations: 2013 Census". Statistics New Zealand. ^ McKinnon, Malcolm, ed. (1997). New Zealand Historical Atlas. David Bateman. Plate 90. ^ a b "Constitution Act 1986". Parliamentary Counsel Office. 13 December 1986. Retrieved 11 November 2018. ^ a b "Glossary". www.ourconstitution.org.nz. Constitutional Advisory Panel. ^ "Electoral Act 1993 No 87 (as at 01 May 2017), Public Act 268 Restriction on amendment or repeal of certain provisions". www.legislation.govt.nz. New Zealand Legislation. Retrieved 2 July 2017. ^ Kaiser, André (2008). "Parliamentary Opposition in Westminster Democracies: Britain, Canada, Australia and New Zealand". The Journal of Legislative Studies. 14 (1–2): 20–45. doi:10.1080/1357233080192088 (inactive 21 February 2019). Retrieved 1 July 2017. ^ "Number of Electorates and Electoral Populations: 2013 Census". Statistics New Zealand. 2013. Retrieved 1 July 2017. ^ "MPs and Electorates". New Zealand Parliament. Retrieved 26 May 2018. ^ a b "Role of Parliament". New Zealand Parliament. Retrieved 17 August 2017. ^ a b Wilson 1985, p. 147. ^ a b c d "Opening of Parliament ceremonies on 8 and 9 December 2008". New Zealand Parliament. 5 December 2008. Retrieved 11 November 2018. ^ a b Paul Moon (2010). New Zealand Birth Certificates – 50 of New Zealand's Founding Documents. AUT Media. ISBN 9780958299718. ^ "Crown colony era – the Governor-General". Ministry for Culture and Heritage. 30 August 2012. Retrieved 13 October 2012. ^ "NO. 21. — CHARTER FOR ERECTING THE COLONY OF NEW ZEALAND, AND FOR CREATING AND ESTABLISHING A LEGISLATIVE COUNCIL AND AN EXECUTIVE COUNCIL, AND FOR GRANTING CERTAIN POWERS AND AUTHORITIES TO THE GOVERNOR FOR THE TIME BEING OF THE SAID COLONY". Victoria University of Wellington. Retrieved 13 October 2012. ^ "Last meeting of the Legislative Council, 1950". Te Ara: The Encyclopedia of New Zealand. Retrieved 25 August 2017. ^ "Senate Bill : Report of Electoral Law Committee". 7 June 1994. ^ "New Zealand Legislates for the 1993 Referendum on its Electoral System". Newsletter of the Proportional Representation Society of Australia (69). March 1993. Archived from the original on 6 July 2011. ^ Luke Malpass and Oliver Marc Hartwich (24 March 2010). "Superseding MMP: Real Electoral Reform for New Zealand" (PDF). Centre for Independent Studies. Archived from the original (PDF) on 2 June 2010. ^ "Writ-ten in the stars". New Zealand Parliament. 23 August 2017. Retrieved 11 November 2018. ^ "State opening of Parliament, 1986". Te Ara: The Encyclopedia of New Zealand. Retrieved 21 May 2018. ^ a b c "Chapter 7 Parties and Government". www.parliament.nz. New Zealand Parliament. 14 October 2010. Retrieved 23 November 2017. ^ Philip Joseph (2002). Constitutional and Administrative Law in New Zealand (2nd ed.). Brookers. ISBN 978-0-86472-399-4. ^ Sir Geoffrey Palmer and Matthew Palmer (2004). Bridled Power: New Zealand's Constitution and Government (4th ed.). Oxford University Press. ISBN 978-0-19-558463-9. McRobie, Alan (1989). Electoral Atlas of New Zealand. Wellington: GP Books. ISBN 978-0-477-01384-0. This page was last edited on 17 March 2019, at 08:45 (UTC).